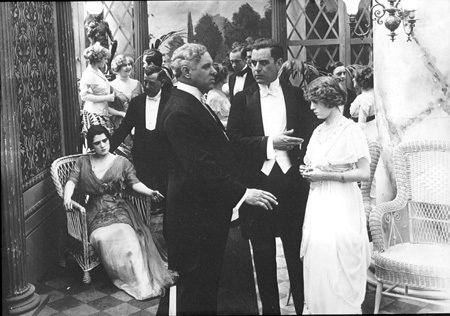 Poster Image Courtesy The Marguerite Herrick Library, Academy of Motion Picture Arts and Sciences and Thanhouser Company Film Preservation, Inc.
Harry Benham standing next to Mignon Anderson in an unidentified interior scene. 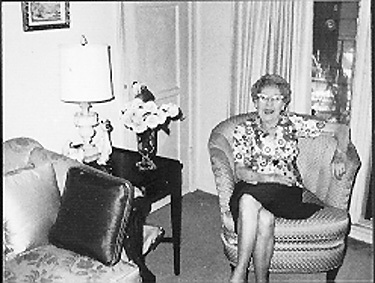 Mignon Anderson, shown in her North Hollywood apartment in the 1970s. Thanhouser Career Synopsis: Mignon Anderson was among the top several of the best known Thanhouser players. She played in many films, of which she considered A Dog of Flanders, The Plot Against the Governor, The Scientist's Doll, The Tin Soldier and the Doll, and Robin Hood to be among the more significant. She married Morris Foster, a well-known Thanhouser actor. Biographical Notes: Mignon Anderson was born in Baltimore, Maryland in 1892. Her father, who was also born in Baltimore, was in vaudeville and opera, and, later, in the insurance business. He died in New York City on September 9, 1914. Her mother was the former Hallie Howard. Mignon, one of three sisters, received her education in New York City. At the age of six months she made her first stage appearance, in the arms of Margaret Mather. As a child she appeared with Joseph Jefferson, Richard Mansfield, Julia Marlowe, Effie Shannon, and other notables. At one time she was also an artists' model. With Thanhouser: Her screen career began at Thanhouser in early 1911 with work in Robert Emmet, released on March 17th of that year. She quickly became one of the company's best known leading ladies and was the subject of much publicity in her time. Film historian Anthony Slide relates that fellow Thanhouser players gave her the nickname of "Filet Mignon"! Like other prominent actors and actresses, her personal life was of interest to countless movie fans, and even the most trivial details, especially if of an unusual nature, were apt to find their way into print. In this category was an item in The New York Dramatic Mirror, June 17, 1914, which told of her pet monkey, Mozart, who, it was said, could play the opening strains of The Is the Life on the piano! Throughout most of 1914, and probably before then, she lived in New York City and commuted to New Rochelle daily. The New Rochelle Pioneer, October 17, 1914, told of an address change: "Mignon Anderson has at last accomplished her heart's desire - she's moved to New Rochelle from New York City, and has taken cozy apartments with her mother, on Randolph Street, near the Remington Station on the Westchester Road." At the time her mother had been recently widowed. The Morning Telegraph, October 18, 1914, told the actress' reason for the move: "Mignon Anderson, Thanhouser ingenue lead, has declared herself a 'New Rochelle suburbanite,' and says it is the easiest thing getting to the studio now. This is how Mignon tells it: 'My goodness, but it's great living in New Rochelle. I can sleep one hour and a half longer each morning and I'm always at the studio before 9 o'clock. I am very glad that I don't have to make that dreadful trip from New York every day. I just hated to think of what it would be in winter!' Miss Anderson resides in a beautiful house in Rochelle Heights, not very far from the studio, and she finds it much more convenient in every way." "Miss Anderson fully believes that the influence of the motion picture stage is greater by far than the legitimate stage. She is fond of all outdoor sports except walking, motoring being her principal diversion and pastime. Miss Anderson is interested in Christian Science and mesmerism, etc., but has not had much time to devote to it; but we do find her 'finding time' to devote to dancing. "'Mig' has a keen sense of humor, is a lover of dumb animals, and believes that every young girl should keep always busy, having discovered that while you are busy you are happy. In between times when scenes are changing we find Miss Anderson in a nice comfy chair working on some piece of dainty embroidery. Miss Anderson makes all her own clothes, and by hand, too, and finds time to do it only while waiting between scenes." 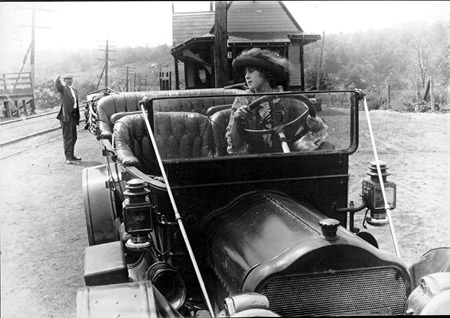 Mignon Anderson in a car against a small town railroad backdrop. A 1913 Sketch: The following appeared in The Motion Picture Story Magazine, February 1913: "If you should rise early on some summer morning and paddle up the Hudson in a canoe, you might meet another canoe propelled by a very slender, very graceful, very blonde young lady - especially if it was Sunday morning, for that is her favorite time to enjoy her favorite sport. And, if you were fortunate enough to find someone to introduce you, you would learn that the fair canoeist was Mignon Anderson, of the Thanhouser Company. "Miss Anderson lives in New York, but she wasn't born there. She was born in Baltimore - which forever dispels the idea that all Southern girls are dark, with big, languishing eyes. But she lives now with her parents, 'way up town, and enjoys it. Her favorite summering place is the Thousand Islands, but she doesn't get much time to go there now, as, like most of the photoplayers, she takes no regular vacations. "She was very busy embroidering a gorgeous pink and cream sofa pillow when I called on her, but she was very good natured about being interrupted, altho I could see that she was dying to be at work again. "'It's beautiful,' I declared, looking over the pillow at the charming face above it, but she didn't seem to notice where my glances strayed. "Brooklyn was the scene of this young lady's school-days. As a tiny child she was playing with Joseph Jefferson, then with Richard Mansfield, when the Gerry Society stepped in and decreed that she must leave her art and go to school. So she went to the Brooklyn Model School - which she declares to be the best school in the world - then to the Girls' High, and then to the field of art again. For some time she was an artist's model, but the photoplay soon claimed her, and she is very happy in her work for the Thanhousers. "'What plays have you done that you like?' I asked. "'Oh, there's always so much that I'd like to change and improve when I see myself on the screen that I hardly know,' she sighed; 'but I enjoyed When a Count Counted and A Six-Cylinder Elopement as well as anything I have done. "'I'm so glad to have met you - your magazine is fine,' she said sweetly, as I rose to go. But her eyes strayed to her embroidery - I felt sure she was calculating how long it would take to make up for the lost time. I wonder who the fellow is that will get that pillow! - The Inquisitor." "It seems that every time there is a chance to flirt with death I get the chance. In The Daughter Worth While, for instance, I raced a Jersey Central Express train in an automobile. I had never driven a car before and took only a few lessons preparatory to the race. I drove the machine at a rate of 75 miles an hour at times, and at every turn I feared something or someone would cross my path. I was nearly prostrated on several occasions, when I heard the machine click dangerously, but I realized that my safety lay in keeping my nerve, and I won the race but felt more joy over getting my feet on the earth without a broken head than I did over the victory. "In The Elusive Diamond production, to escape robbers I swung myself from a window 22 feet above the ground, dropped 10 more, jumped into a machine I was not sure I could operate and drove for the police at top speed. The thought of swinging out of the window was terrible. One mishap and - well, the director congratulated me when it was all over, so it was worthwhile." "This little ingenue, known wherever photoplays are shown as 'The Daredevil' because no risk is too great if the script calls for it, made an 18-foot drop from a tree after an assistant director got injured showing her how it should be done. In The Tin Soldier and the Doll she jumped from a high cliff, and in Jean of the Wilderness, in which she shared honors with Morris Foster, Mignon wouldn't allow the director to 'fake' the fall, but insisted on being allowed to make the big drop, something like 25 feet, which she did to wonderment of critics, who are prone to see 'fake' in everything where a girl has jumps to make. "Perhaps in Lost - A Union Suit 'Miggie' had her most irresistible part. With Morris Foster she sent over a convincing comedy, in the hands of others might have turned out to be a farce of the most absurd kind. It was her convincing manner that created laughs as she wiggled as 'Morry' picked up the raveling that separated 'Miggie' from the union suit, and her intense seriousness endeared her to everyone who saw the photoplay. "Miss Anderson is a girl of intense desire. A desire to make and keep friends and she is doing it with charm. To know 'Miggie' is to love her, and she receives thousands of letters yearly from swain all over the country. At the studio the children flock to her, and all the girls haunt her dressing room. She is a swimmer of note now, having mastered the art this summer, but before she knew how to swim she never objected to tossing herself in the Sound for a picture, having the greatest confidence in her directors. She has been with the local studio several years, and everybody hopes she'll be there for several more. 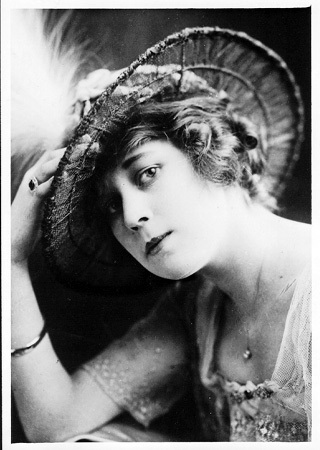 With her mother as chaperone, she recently made a trip to Wyoming under direction of Carl Louis Gregory to play opposite Morris Foster in several dramas. Everybody loves Mignon because she loves everybody." "Mignon Anderson, known at the Thanhouser studios as 'the daredevil ingenue leading lady' weighs only a hundred pounds but to all intents and appearances she has the vivacity of a woman twice her size. "In The Tin Soldier and the Doll, Miss Anderson was asked to fall off a stone wall 15 feet high. There were no 'if' nor 'buts' from the intrepid Thanhouser leading lady. She made the stage fall with a realism which laid her up for four days with a badly wrenched back. She insisted at the end of her period of indoor confinement, upon being permitted to view the film which depicted her fall and was wheeled to the studio and given a point of vantage, from which to view the film in the projection room. When the fall was projected on the screen the employees of the Thanhouser studio involuntarily cheered the daring of Miss Anderson and 'the little magnet' wanly smiled her appreciation. Several days later she was back at work, apparently none the worse for her mishap. "Miss Anderson was educated privately and at boarding schools in the neighborhood of New York. She is highly accomplished and 'fits in' wherever needed in studio work. There is no sport in which she cannot at least 'make a bluff at it,' as she termed her ability when question for the purpose of the present interview. "Recently she made an aeroplane flight with Philip Ward Page of Boston at Marblehead, Mass., in Mr. Page's hydro-aeroplane. When Mr. Page told her that there was comparatively less danger in a hydro-aeroplane than in the old-fashioned aeroplane, Miss Anderson insisted upon an ascension in Mr. Page's Curtiss machine. Mr. Page permitted her to handle the steering gear and she warped the air flyer's ailerons with the savoir faire of one born to the air, so to speak. "Last winter she appeared in several skating scenes, was filmed in a roller-skating comedy and this spring 'tended engine' at Stamford, Conn., in a $10,000 motor boat which won the prize at the recent motorboat show at Grand Central Palace in New York. She can steer a yacht and intends to take 'time off' to view the American cup championship races this summer. "'Recently she had a bad fall from her horse while riding through Westchester County. Fortunately she landed in a ditch and while badly splashed up was none the worse for her cropper. Miss Anderson grieves constantly that she cannot appear in more outdoor work where her varied accomplishments will have greater scope. 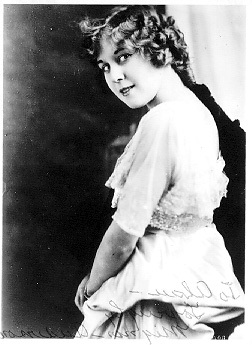 "Before entering the motion picture field Miss Anderson was with the late Richard Mansfield and later, for two seasons, played an important role with Herbert Kelcey and Effie Shannon in The Moth and the Flame. With her savings from the legitimate stage, Miss Anderson bought herself a high-powered motor car and now spends more time in the tonneau than she formerly did in the saddle. In personal appearance Miss Anderson is a blonde with a shell-pink complexion." "Cupid jumped way back to New York and up to the Thanhouser studios, where he whispered into the ear of Miss Mignon Anderson and told her it was time that she and Irving Cummings were having the knot tied. She did not demur in the least, and when Cummings was asked about it he was so glad that he wanted everyone to know about it. So he said: 'Yes, Miss Anderson and I are going to be married some time next month, although the date has not been decided upon yet. The news might as well get out now as any time.' 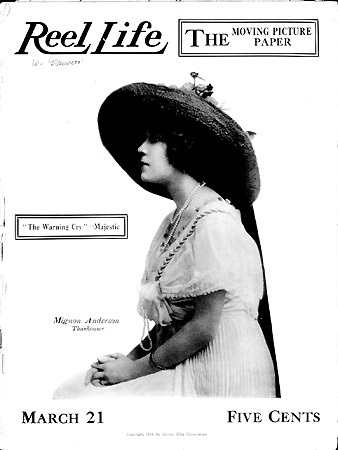 Miss Anderson is the ingenue of the Thanhouser company and enjoys national popularity. She is a petite blonde and very pretty. Mr. Cummings is a well known screen actor whose work has pleased thousands of people." The New Rochelle Evening Standard, May 16, 1914, carried this front-page item: "Pretty Mignon Anderson, who has been a leading lady in the Thanhouser forces since the organization of the concern, is to become the bride of Irving Cummings about the first week in June. Mr. Cummings recently became leading man in the local organization. Miss Anderson is extremely popular, personally and pictorially. She often plays juvenile leads." However, the union did not take place, and on April 16th of the following year she married another Thanhouser player, Morris Foster, instead. The New Rochelle Evening Standard, April 17, 1915, told of the marriage ceremony: "Though she will always remain Little Mignon to her friends and Miss Mignon Estelle Anderson in the movies, she is now Mrs. John Morris Foster in private life. The change came last evening when Reverend Albert F. Tenney, rector of Pelham Priory, made her the bride of Morris Foster, one of the leading men of the Thanhouser Film Corporation. It was a quiet wedding at the bride's home, 25 Remington Place, as her family are in mourning. Only the immediate relatives were present. The bride was attended by Miss Katherine Breese, Providence, Rhode Island, a chum of hers, and Jay Yorke, an actor, New York City, acted as best man. "The couple have been working hard recently in different pictures and consider themselves lucky to obtain leave of absence for 10 days for their honeymoon. Mrs. Foster is a daughter of Mrs. Hallie Howard Anderson and has been with the Thanhouser Film Company nearly five years. Beginning at the bottom she soon became a leading lady and is now one of the motion picture favorites of this country. She is seen on the screen all over the civilized world wherever the Thanhouser pictures go. She was at one time well known as a child actress appearing with Mansfield, Harlow and other stars of the modern stage and is still very young. Her wedding dress was made in the fashion of 100 years ago and consisted of silk and chantilly lace. Her veil was caught up by real orange blossoms. Her bouquet was made in the old French style of the same period and contained white roses and orange blossoms. She wore a diamond brooch, the gift of the groom. The orange blossoms were real and were sent by Mrs. Dumond Lowell, Los Angeles, California, his sister. "Mr. Foster has been with Thanhouser a year and a half and has played opposite to Florence LaBadie, but most of the time opposite to Miss Anderson. He is popular at the studio as well as prominent on the screen. They have gone south for their honeymoon and are going through the country that is familiar to Mrs. Foster, for she is a native of Baltimore. On their return they intend to board at the Pepperday Inn, but later they are to go to keeping house." The New York Evening Mail of the same date gave the why and wherefore of the couple's wedding: "Mignon Anderson and Morris Foster, very well-known film players of the Thanhouser forces are married. So the word comes from New Rochelle. They have been on the verge for many moons, but a little jesting and the urging of a few friends, who said, 'Sure, why not?' When they had a chance to get $200 for a wedding present it made them do it, rather suddenly, on Friday. It seems that Mr. Thanhouser and Mr. Rubenstein, his publicity man, were laughing and talking with Miss Anderson and Mr. Foster just after the taking of a love scene asking them why they didn't really get married. Someone suggested that they didn't have nerve enough. Mr. Rubenstein offered to bet that they did. Finally Ruby offered the bet to Mr. Thanhouser and it was taken. Then Ruby told the couple if they would win the bet for him he would give it to them for a wedding present. Net result: Mr. Thanhouser made his young stars a wedding present of two hundred." On May 1, 1915, The Evening Mail printed more about the pair: "You remember me telling you about Mignon Anderson and Morris Foster of Thanhouser deciding that they should join hands for good and all? Well, they did it and this week they returned to the New Rochelle studio. But they were greeted mysteriously by their friends about the big plant. They thought maybe some one had heard of how they were regarded by one and all in Florida as an ideal 'bride and groom,' and the secret did not come out until they had been led gently by the hands to the executive offices. There they beheld a wonderful Colonial silver set, a gift from Thanhouserites to this happy pair. Oh, yes, they are going to continue to appear in the Thanhouser films." Their honeymoon was spent in Jacksonville, Florida. The union proved to be a happy one, and they remained in love until Foster died on April 24, 1966. 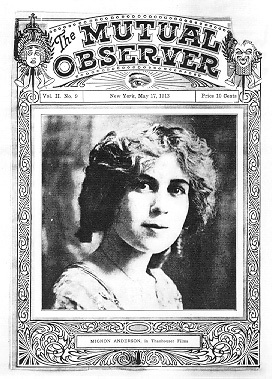 A Vivid Dream: Writing for The New Rochelle Pioneer, February 20, 1915, John William Kellette told of an incident in Miss Anderson's life: "'The Midget' has been to the edge of the grave and came back again, and now she's listening to the demands of Thanhouser directors and playing leads opposite Morris Foster, the popular Thanhouser star, for 'Mignon' has been away from the screen for more than six weeks for an operation for appendicitis, and because of that operation herein is the gist of the story which follows. "Miss Anderson discovered something while under the influence of ether, that obsessed her so strongly, that she related to the incident to the writer, and it will bear retelling here. "'The Midget,' as she is lovingly called at the studio, had a strange dream you may call it, but she claims it to be an experience - when, after going upon the operating table and almost choking to death over the fumes of the either, she felt herself sinking into a blackness more terrible than anything she had ever imagined. She heard someone shout for 'lights' and she imagined herself back at the studio, but no light came. Instead, she felt her wrist grabbed suddenly by a Bewhiskered Patriarch who was speaking to somebody in the dense blackness. "'Miss Anderson stands guard tonight,' said the B.P. "'Well, place her on the Western Hemisphere,' replied the voice of a man she could not see. "She was taken to a little nook and left for a moment. Slowly, as her eyes became accustomed to the strangeness and the darkness, she made out two globes that she recalled she had seen in geography at school, but upon these globes, which were larger than anything she had ever seen before, were belted running boards such as one finds upon summer street cars. The running boards were not more than a foot wide, it seemed, and they touched at a central point. 'Miggie' thought it all out. Hers was an astral body and she began to understand the biogenic life. The B.P. returned and Mignon shrank from him. He laughed at her fears. "'But where is your lantern?' queried Miss Anderson. "'We need no lantern at this time,' he replied. 'It is night, and it is your turn to stand guard over half of the world. You will take your station at that granite wall and remain until morning. Allow no one to pass, and give the alarm should anyone from Mars attempt to invade your territory. There are many others stationed at various spots about both hemispheres, but under no circumstances leave your post.' The B.P. stationed 'Miggie' at the 'granite wall,' and was gone in an instant. Miggie looked about her. Was that the Hudson River running beneath her station, and were these the Palisades that she stood against? It was all so strange. She realized, soon, that the world was traveling toward dawn, and it was taking up a tremendous pace. She was not alone, she found out, by any means. Always a little ahead, on the other hemisphere, she could make out faces. There was 'Morry' Foster just beyond earshot. She'd like to reach him, but she couldn't and were she to try to make the step across, she was sure she'd fall to the yawning abyss below. As she'd look beneath her post, she'd see it change from running water to space in one instant; jagged rocks and mountain tops in another, or forests of limitless size. She'd pinch herself, to see if it were all real. She'd feel the pinch and decide that it was. "On the other running board, across the way, she counted hundreds of wraiths and humans standing guard - in panoramic reviews came the faces of stars who had come and gone from Thanhouser's - Billy Russell, 'Buddy' Garwood, Barry O'Neil, Martin Faust, Jean Darnell, and countless others, and nodding to her from other places would come the smiling faces of Harry Benham, Peggy Snow, Jim Cruze, Florence LaBadie, but always, just ahead, Morris Foster. "And then, something happened! She found herself shoulder to shoulder with one of the Asiatic races and the speed of the earth slackening. What was happening. She tried to cry out. She couldn't! Her shoulders seemed to be crushing in - one against the Palisades and the other against this unknown person, who stared with frightened eyes at her. Their cheeks touched. The crush was dreadful! Ah! It was easing off and she felt herself able to breathe, but what was this? Her cheek was caught to that of the Asiatic! Oh! the pain of it all! "Foster was looking at her and smiling as if to encourage her. She didn't have time to even think him rude. Wider and wider grew the gap between the running boards. The central point had passed, but the cheeks stuck! It appeared to 'The Midget' that cheeks were made of India rubber for just this purpose. The pain was killing. She tried to cry out - and, succeeded! "'The city is not going to burst,' came back a voice she could not recognize. "'Then the country is going to burst!' chided the frightened ingenue. "'The county is not going to burst,' thundered back the voice. "Oh, wouldn't something happen to relieve this awful agony? She put both hands to her cheeks to try to help the strain - there was a snapping of cheeks! There was a tremendous light as if from burning arcs. "'The whole world is going to burst!' shouted the now thoroughly frightened guard. "She felt herself seized from behind. She was in the arms of the Be-whiskered Patriarch, and she tried to struggle. She noticed that 'Morry' Foster was trying to make his way to her from the opposite running board, as he bowled over several Asians, then all was black to her. She remembered struggling, but to no avail. "Mignon was ruthlessly thrown upon a table and several hoary men of the Pleistocene period hovered over her. One held a knife. He was bent upon killing her, and these others simply looked on, and held her, and took everything for granted. As she struggled, Foster rushed into the room and the assassins-to-be gave way. Mignon opened her eyes! "True enough, Foster had hold of her hand, and the people who had rushed her to the edge of the grave were the physicians that were trying to bring her back. It was several hours before Miss Anderson realized that she was truly in the hands of her friends. "The 'dare-devil' ingenue became ill just after the filming of An Inside Tip, a Thanhouser single-reeler of newspaper life, in which Miss Anderson and Morris Foster took the leads. The script called for a dive overboard from a speed motorboat wherein Miss Anderson was to rescue Mr. Foster, whom crooks had dumped into the Sound, bound and gagged. In attempting to make the leap or dive, Miss Anderson struck against an upright and the tossing boat hurled her heavily against a support. She was dazed, but if the reader remembers the photoplay, they will recall that as she reeled backward willing hands caught her and two officers made the leap after Mr. Foster. It was presumed that at this time Miss Anderson received the injury that necessitated the trip to the hospital. "In health Miss Anderson weighs 98 pounds. She doesn't weigh that at this writing, however, but her dreamy blue eyes and blonde hair are the same, and the little Baltimore-bred girl is dearer than ever to her co-workers because of her absence from them. "It is a matter of interest to know that since she was a child in arms Miss Anderson has been upon the stage until coming to Thanhouser four years ago to work in her first picture - Robert Emmet. Her father, Frank Anderson, played with all the stars of the old school - Booth, McCullough, Louis James, Robert B. Mantell, James H. Wallick, Charles B. Hanford and many others, since, and from the time 'Miggie' was a tot, she had the baby parts in those companies. "She has been in almost 300 photoplays and loves to do scripts that calls for deeds of daring. She wouldn't hesitate to fall from a horse or jump from the top of a building into a fire net if the script calls for it, but directors are warned not to allow her to do anything very strenuous for some time to come. She will continue to play leads opposite Morris Foster, however, in photoplays written especially for this talented team." January 23, 1915: "Miss Mignon Anderson, one of the leading individuals at the Thanhouser Film Corporation, underwent a successful operation for appendicitis in the local hospital Sunday evening." April 17, 1915: "'Morry' and 'Miggie'! They played leads this week in the biggest drama of their lives. Let us hope both will find comedy lines that will take the edge off the heartaches, that troubles will be only imaginary ones, that their little drama will continue to be filled with heart interests, and that the only thrilling moments will be when Morry mixes it up with the furnace and fills the house with smoke. If Mrs. Morris Anderson-Foster and her hubby gets all the good things 'Kell' [John William Kellette, the writer of the article] hopes for, they can never get more. A long and happy life, filled with the joy of companionable chumminess, tinged only with little troubles and vexations, can be handled on your knees." July 31, 1915: "Morris Foster, one of the Thanhouser leading men, and his wife, Mignon Anderson, famous for her many leads in Thanhouser photoplays, recently purchased a high powered car. They spend all of their time away from the studio speeding over the beautiful roads in and about New Rochelle." August 28, 1915: "Mr. and Mrs. Morris Foster, nee Mignon Anderson, who have been residing at the Pepperday Inn since their marriage, are now keeping house at Beacon Hall." September 18, 1915: "Mignon Anderson is planning a trip to the Panama-Pacific Exposition. Just when she will depart, however, is a matter of much conjecture, for she has been cast in the lead in several productions now in preparation." Later Years: In late 1915 and early 1916 she lived in the Orleans Hotel in New Rochelle. In March 1916 she and Morris Foster left Thanhouser to join Ivan Productions, for whom she appeared in The City of Illusion and Her Husband's Wife. In March 1916 she, her husband, and her mother were living in an apartment in New York City and were with the Vim studios there, according to The New Rochelle Pioneer. In January 1917 she went to Universal, where she remained for about a year, after which she appeared with various studios on a freelance basis. 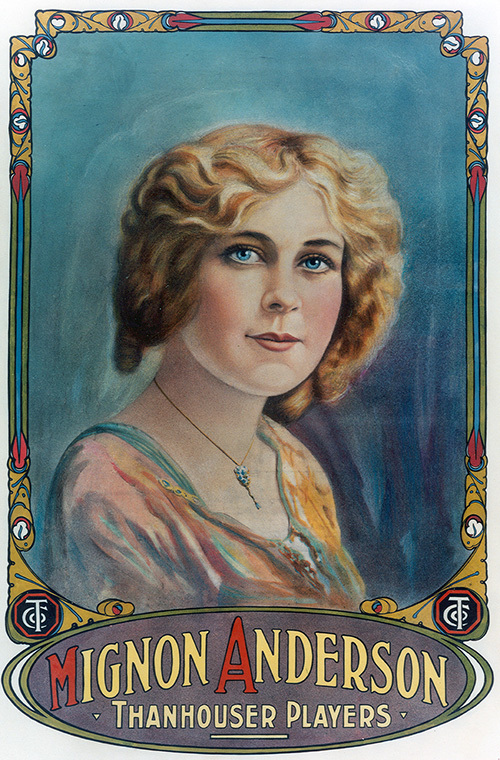 Among her later films were the 1917 Universal releases of The Hunted Man, The Young Patriot, Meet My Wife, The Master Spy, and The Getaway; the 1918 Rolfe release for Metro of The Claim; the January 1919 Universal release of The Secret Peril; the 1920 Clermont release for Republic of Mountain Madness; the 1920 Empire State release for Peerless of The Heart of a Woman; and what is believed to have been her last film, Kisses, a Metro release of 1922. Around 1919 she and her husband were on stage with Pauline Frederick in The Scarlet Woman. In the late 1920s, Mr. and Mrs. Foster were on stage for a year with a Salt Lake City stock company. From autumn 1916 through at least 1918 she lived or maintained a home address at 537 West 142nd Street, New York City, according to studio directories, although for part of this period she was in California. She was 5' tall, weighed 94 pounds, and had blue eyes and golden hair. For recreation enjoyed horseback riding, motoring, and tennis. "Did the studios send limousines to pick her up for work in the morning? 'I should say they didn't - I went on the bus!'" Mignon Anderson died in Los Angeles, California on February 25, 1983. At the time she lived at 123-B North Maple Street, Burbank, California, about a block from the Warner Bros. studio.